Okay, I’m guessing you are either getting ready to play or playing life size Jenga now and are in an argument. 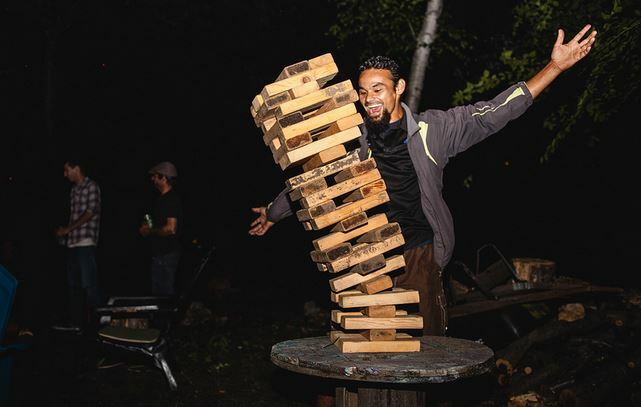 Here I hope to help you playing Giant Jenga, life size Jenga, jumbo Jenga, jenga drinking game or what ever you want to call it. First thing is first, the main rule of this game is to not be the one to knock it over. I’m sure you already know this but wanted to get it out of the way for those people needing a little more “help”. The next thing to know is there really isn’t any “official” rules since this game is more of a movement and not a brand like the small table top Jenga. So you can either use the small version rules or go another route. We personally go another route to make it much more fun. So, lets go over the rules I was taught when I learned of this game in the Turks. Stack the Jenga blocks as normal and decide the order of play. This can be by age or whatever you like. Player can only use one hand. When removing a block, the player must be holding a drink in one hand. This helps keep the drinks flowing. Player can steady the stack of blocks but can’t do so while removing a block. Basically, one hand on the Life Size Jenga game at a time. You can steady, then you must let go to move on. Blocks can’t be removed from the top 3 levels at any time. So no top shelf cheating! Once block is removed, player must stack it on top of game without knocking it over. Must stand until the next player starts. If it falls while it is your turn, you loose. People will laugh and point at you and maybe even call you childishness names. Get over it, you knocked it over. Looser must re-stack or put game away. Marking the blocks prior to putting it together makes for a crazy fun addition to life size jenga. Here are some ideas. Those are just a couple ideas but you can mark random blocks with anything to keep things alive. You could even go naughty if you are into that type of thing. No matter if you go with our house rules or make up your own, the most important part is to have fun. It is about spending time with family and friends and making memories! Want to buy your own set? Check out our suggestions here. Do you use other rules? Share below and I may even add them to our house rules!